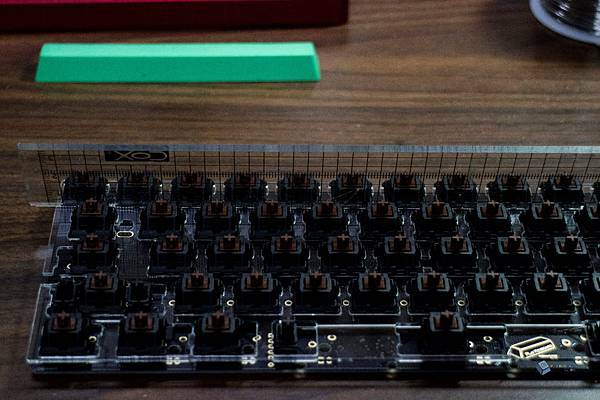 These were tools I would use when building a keyboard. Some were not in the photo. They will be showed up later. 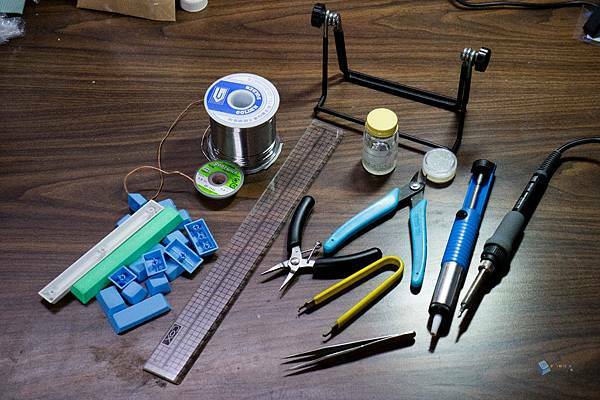 The thing I need to mention particularly is the soldering iron. I recommand you pick up one with 30W or 40W. Lead free solder wire is also recommanded for enviromental protection. 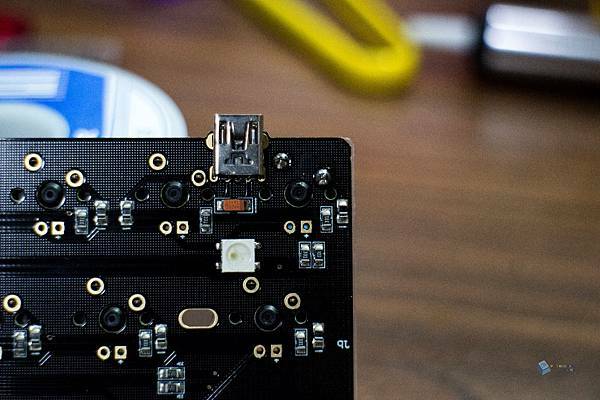 Desoldering pump is for removing the solder when you install a switch to a wrong position. 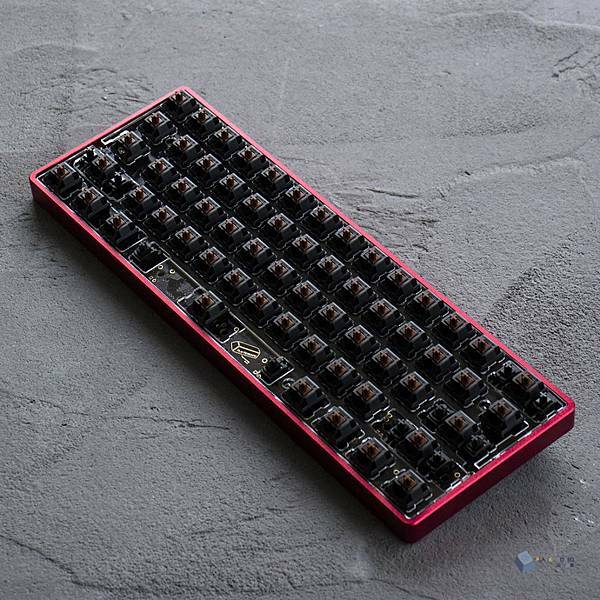 A mechanical keyboard normally composited by a case, a switch plate, a PCB, switches, stabilizers and keycaps. We don't focus on parts variants in this article. First you have to test your PCB to make sure it's functioning normally. 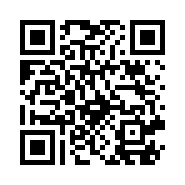 I recommand you flash your keyboard with your hex file before testing it. 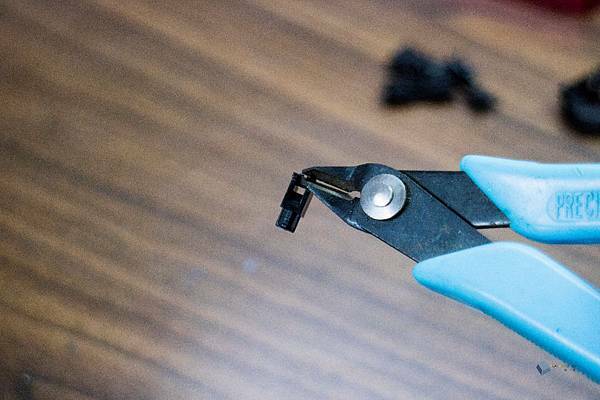 Plug in your cable, and pick up a tweezer to short both switch holes to activate the signal. All holes should be tested. There are some position sharing the same signal, then just choose a pair to do it. Same for LED holes, turn on backlight and insert a LED to see if it lights up. 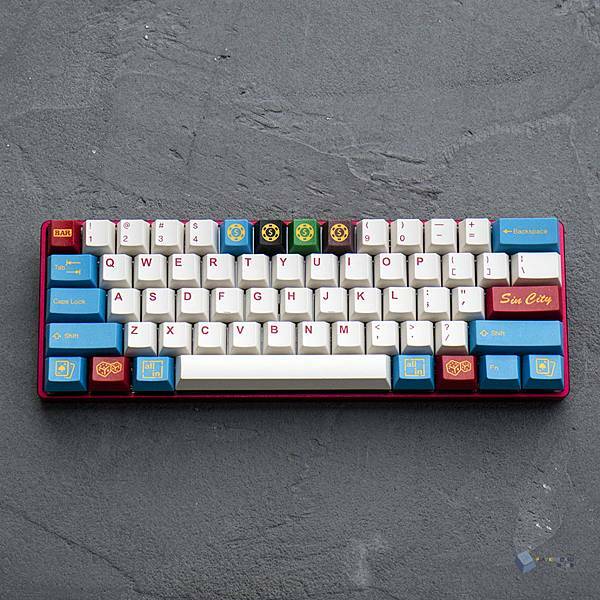 Generally keycaps longer than 2u all need a stabilizer. 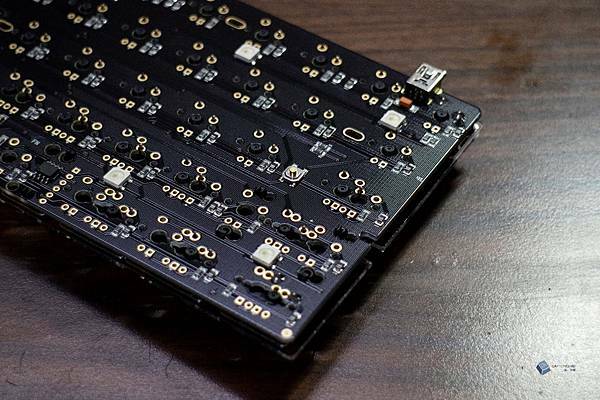 PCB stabilizer is the only option now for keyboards to be compatible with many layouts. 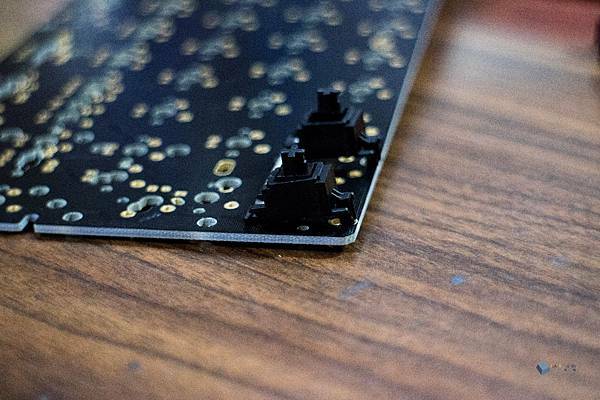 Mostly you have to desolder whole keyboard to fix a broken PCB stabilizer, which is the disadvantage. 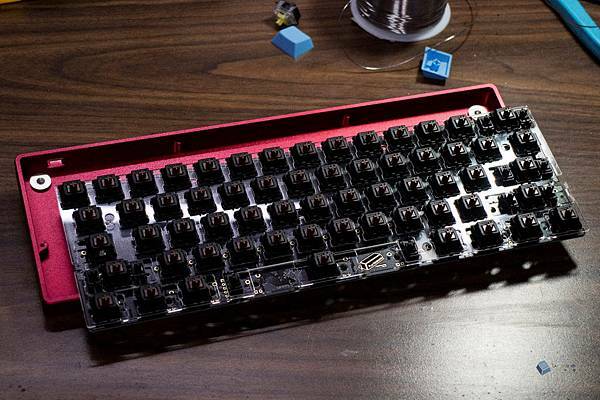 You can avoid that by applying force averagely when removing keycaps. 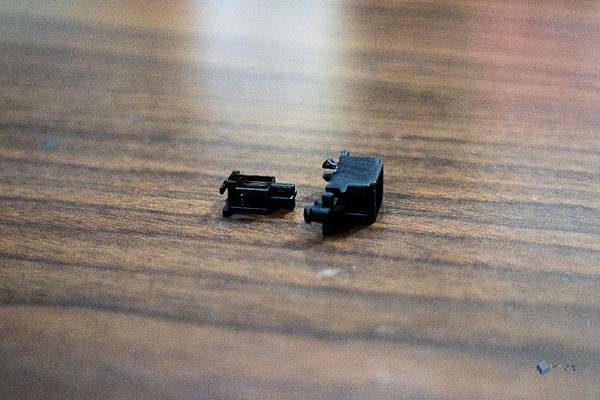 Clip the feet which I think it's the reason causing the stablizer being rough when pressing first. A diagonal plier will do the work. Next step is lubing. It helps stabilizers become smoother and reduce sound. You can lube both sides of axis a bit with a thin watercolor pen. Put them in to stands when they are ready. A side of axis with two hole shoud meet a side of stand with a opening. 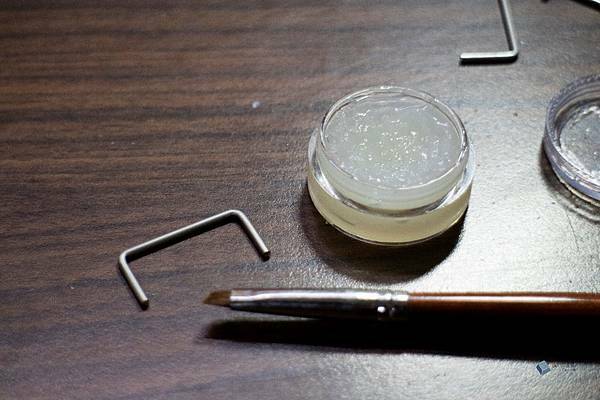 Thick lubricant works well with wires. 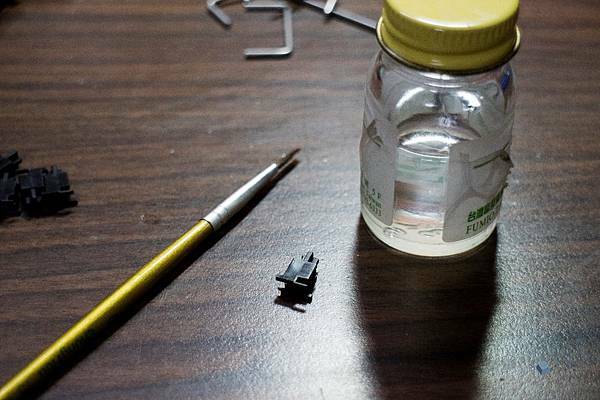 Apply some to the part that installed in latch of stands. Assembly them when they are ready. Install stabilizers first. It's not available to do it after you combine switch plate and switches with PCB. Please follow those circles and squares for indication when installing. The look when they are all done. 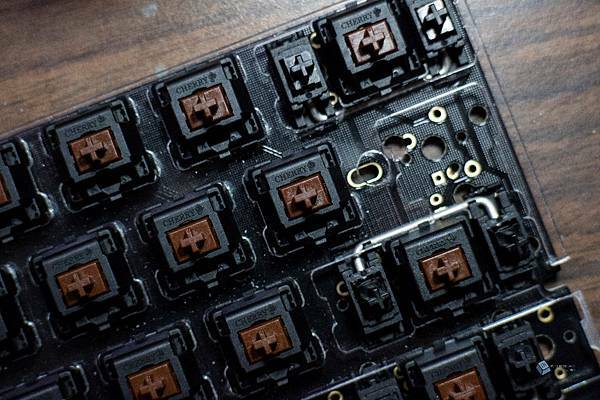 If they are smooth when pressing, we can move to next step for switches and plate. The look after combining all parts together. 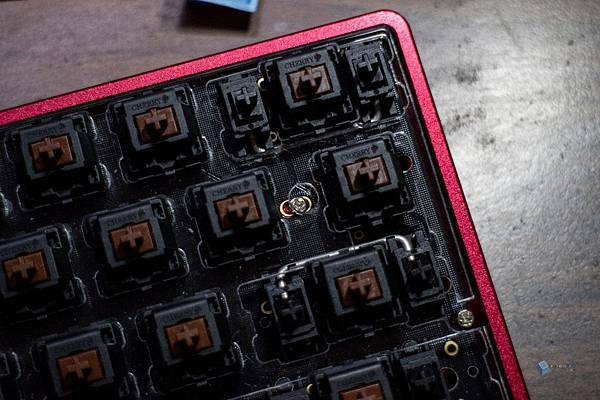 If you are not sure where to install switches, use some keycaps for indication. 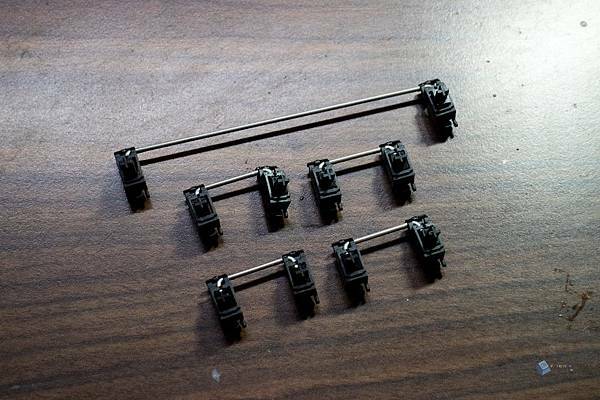 Normally, you need a plate for plate-mounting switches. 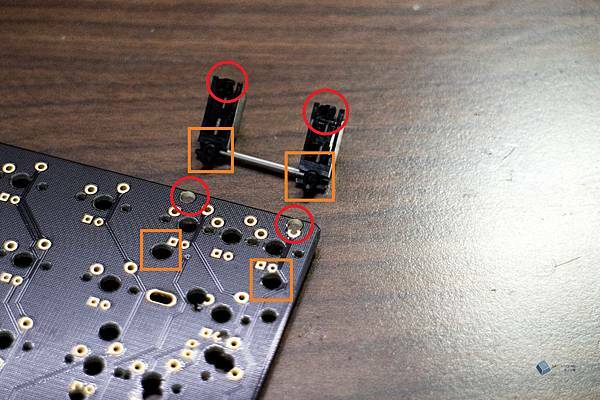 Use PCB-mounting switches if you are not going to use a plate. 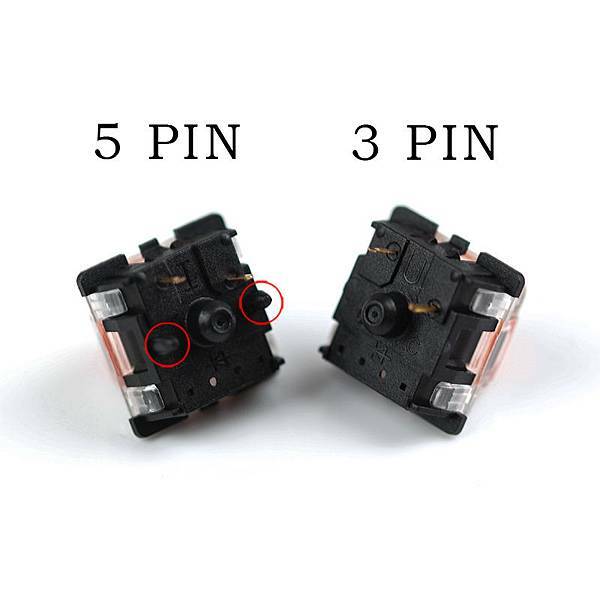 There are two small holes in PCB, which are for PCB-mounting switches. 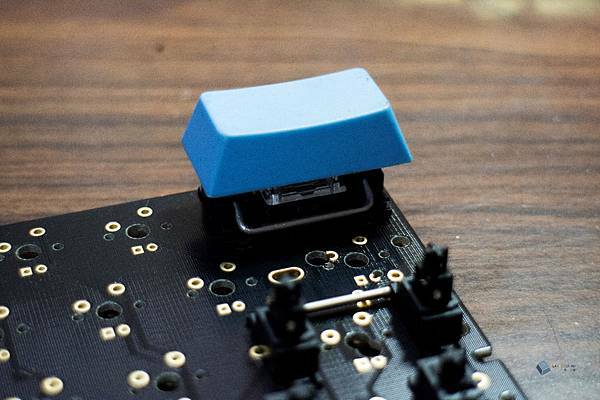 It's also available for using a plate and PCB-mounting switches. 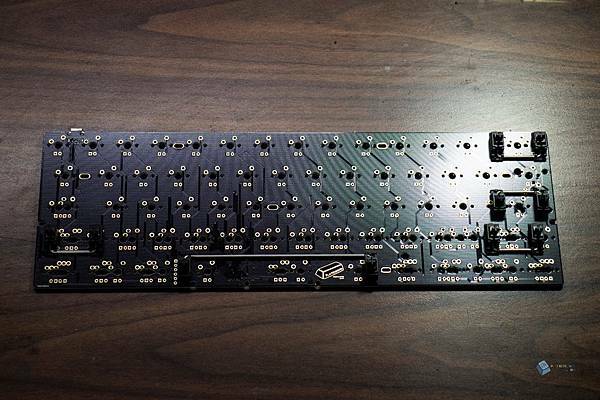 I recommand you put all switches in first to make sure the plate is flawless before soldering. 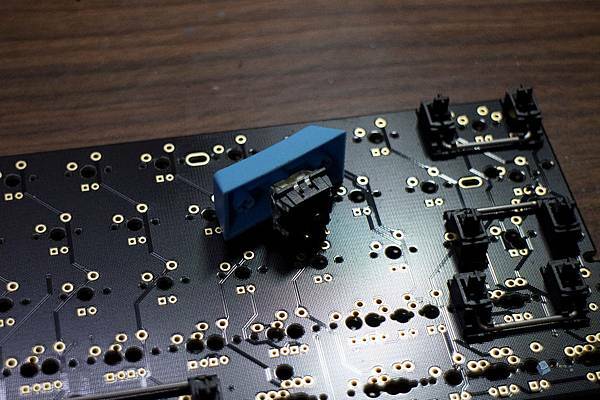 You can solder corner switches to make sure plate and PCB combine firmly. Sometimes backspace needs to be tuned a bit. You can pick the left one to do it. 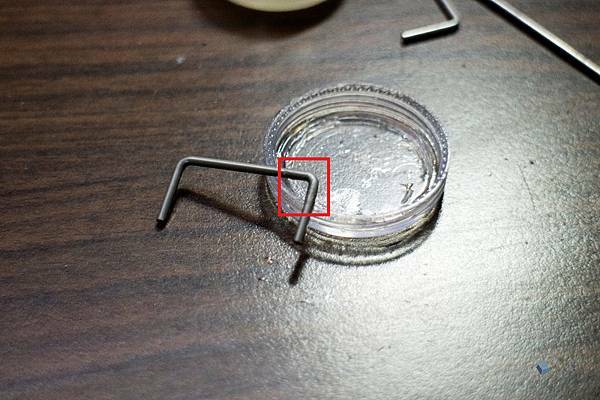 The above pic shows you how to solder. 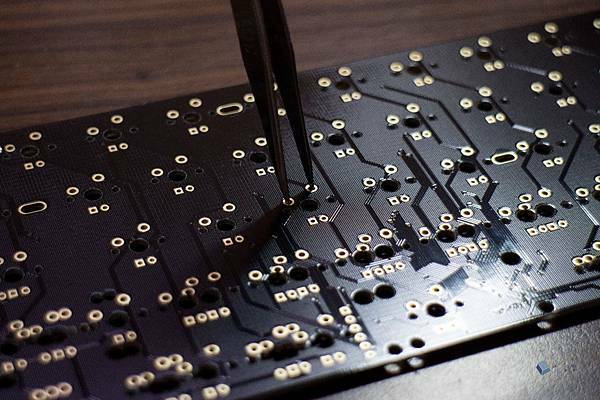 Try to cover the pad with solder completely. A well soldered switch. 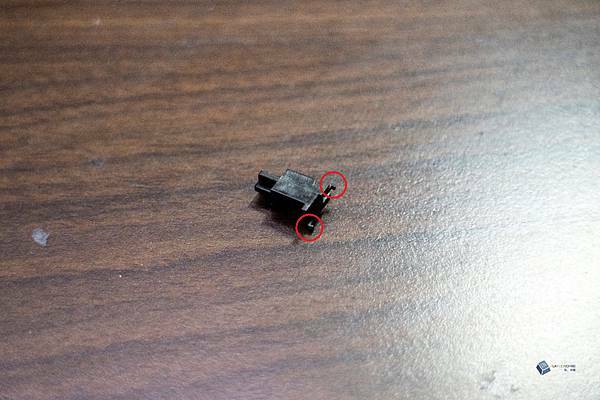 You need to give iron some time to heat up the solder to make switch pin and pad been surrounded by solder perfectly. 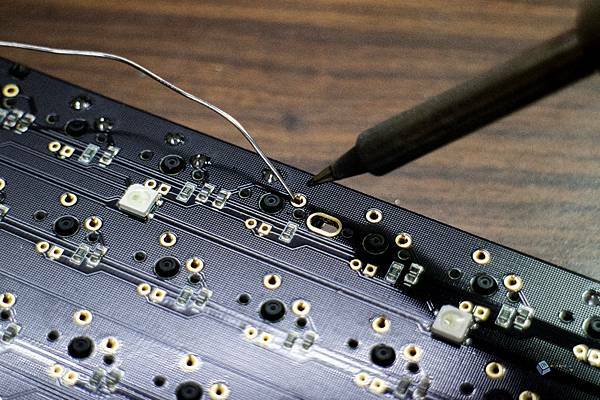 When corners are ready, solder them row by row. You can skip long length caps and deal with 1u positions first. 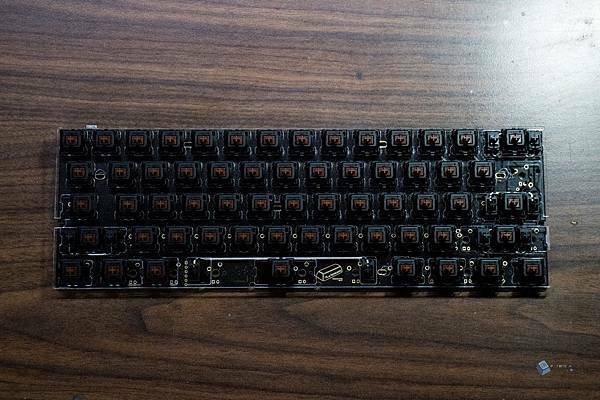 A plastic ruler is a good tool to help you tuned crooked switches. 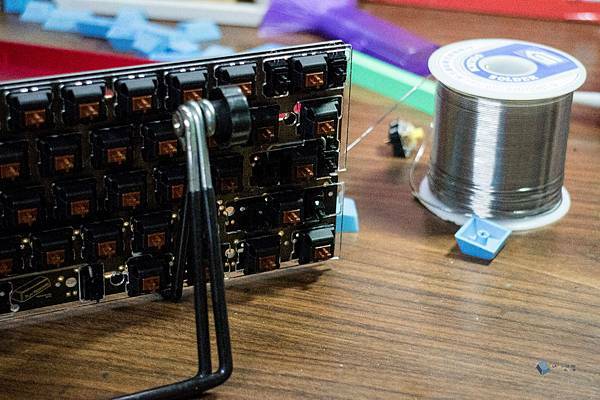 Leans it against switches and push them up to make switches be in the right position. Make sure latches of switches are out. If there are some switches not able to stuck with plate, a pad holder is sweet stuff for helping. You can make PCB straight up putting it in the holder for using fingers to hold switches in the right position, then soldering it. 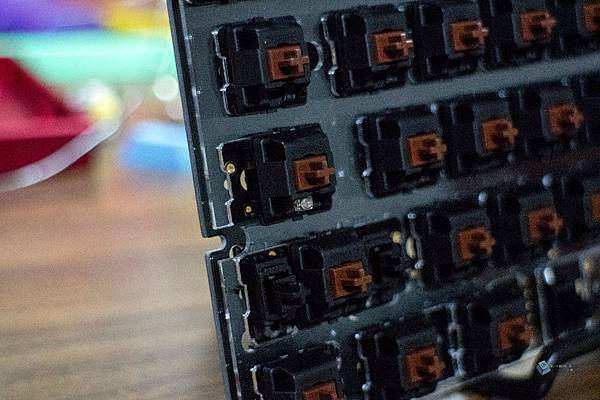 Install and press keycaps in switches to see if positions with stabs are crooked. 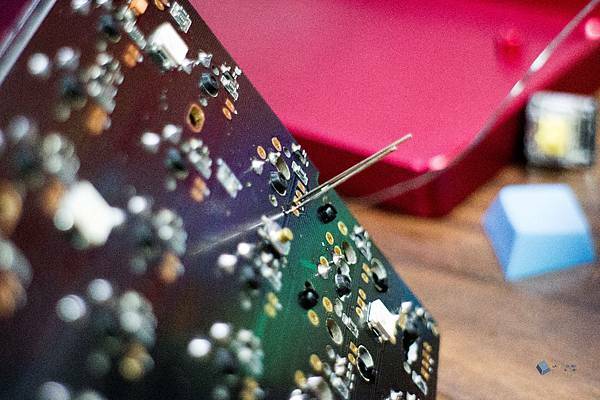 I recommand you solder LEDs with a pad holder as well. Don't bend LED legs for setting LEDs. 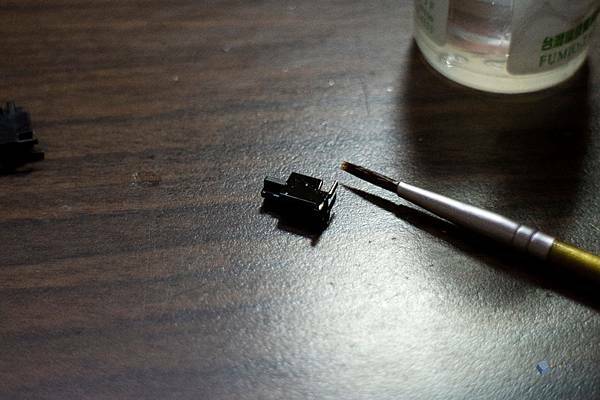 Soldering a led first. If the LED still has distance to final position, heats up solder again then pushing down. The remaining leg will be easy to deal with after these steps. 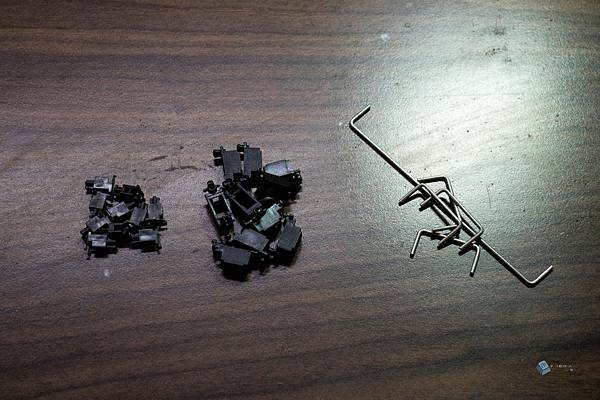 Cut extra legs after finishing soldering. 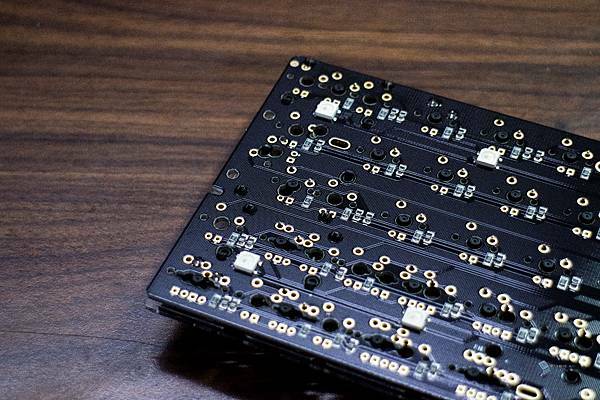 Install plate and pcb in the case. 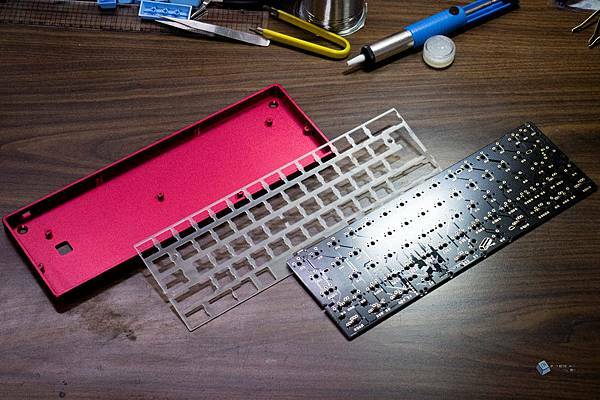 The above is the basic guide for building a mechanical keyboard. Thanks for reading.